Only SwimOffice Pro customers will see this calendar and feature. It will open a window into Coaching Tools where you can build and schedule your practices, then have them display on your SwimOffice calendar. You must be logged in as an Assistant Coach or Head Coach to be able to do this. Note that you cannot create new workouts from here, but you can select existing ones. Note: If you are not a SwimOffice Pro customer, add a General event for practices instead. Or contact Sales to learn more about SwimOffice Pro. You can add a Coaching Tools Practice three different ways. Click New Calendar Item > Practice. In the list of calendars on the left, click by Practice. Create a Practice directly in Coaching Tools and it will automatically show up on the SwimOffice Calendar (skip the rest of the steps if you did this). Enter a Practice Title. Using something like the roster name is common, such as “Gold A.M.” or perhaps the coach’s name. Notice it fills in the Alias with the same name, which is displayed in the Calendar. Select a Roster, Location, and Course. Note you can’t put two different rosters in the same practice, so you’ll need to create a separate practice for any rosters that meet at the same time. Enter your practice Duration, such as 200 (for 2 hours), Done. 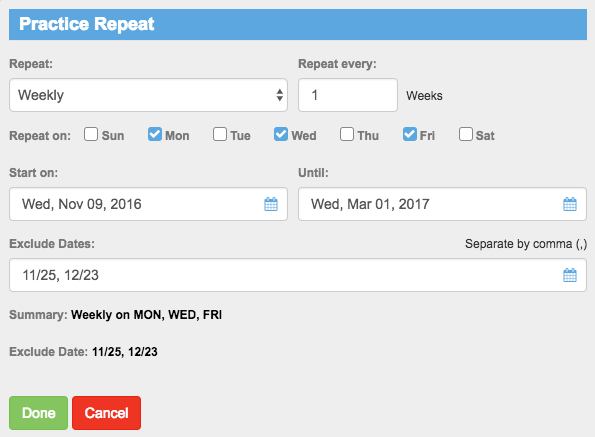 If you only want to schedule practices for now, check the Repeats box, then enter the frequency, days of week, ending date, and any dates to exclude, such as holidays, and click Done. If you want to build a singular practice rather than schedule several, use the Workouts Library on the right to find and add existing workouts. We cover this in detail in Write a Workout. Use Search and filters to find the workouts you want. Click a workout to see details. Double click or drag and drop to the Workouts area on the left. You can fill in Practice notes, but they are typically for individual practices. When viewing Coaching Tools Practices on the calendar, you can use filters to only see the Practices you want. By default, events for all Roster Groups, Locations and Coaches are displayed. On the Calendars list on the left, click Practices to open the filters list. Click the All Roster Groupsdropdown, then click the group you only want to see. In the same way, click Locations and Coaches to select only the ones you want. Click No Workout to view only Practices that do not have workouts defined. Click again to toggle off. Click Test Set to view only Practices that have test sets. Click again to toggle off. It's now time to learn about Registration Events.